In the mood for a cheesy slice of pizza? Order your favourite pizzas and sides from a Pizza Hut restaurant near you. Get Pizza Hut Delivered with $21.90 minimum spend. Get Pizza Hut delivered to your door! Hot, cheesy and loaded with delicious toppings, who doesn’t love a pizza? It’s the perfect, one-handed, complete meal! Unless, you’ve got a phobia of triangles (it’s a thing). Wars have been fought over whether pineapple belongs on this wonderful invention, who’d have thought a fruit could be so divisive? But that’s the beauty of a tried and trusted Pizza Hut pizza – there is no snobbery or ‘right’ way to enjoy pizza. Just choose whichever pizza ticks the boxes for you and you’ll soon be relishing in mouthfuls of yumminess. There really is nothing like biting into a hot, yummy, cheesy pizza, except if you haven’t had to leave your home to fill your tum – now that’s a good feeling! Hooray for Menulog who can get your food to you fast. Pizza Hut is the ultimate crowd-pleaser, but we won’t hold it against you if you want to eat the whole thing on your own. Whether you’re feeding your family or your footy team, forget fussing around with cooking (and cleaning), Menulog will ease the pressure and make every meal time great! Since the very first ‘Hut’ opened its door Down Under in 1970, Australians have munched down on gazillions of deep pans and thin’n’crispys with reckless abandon. 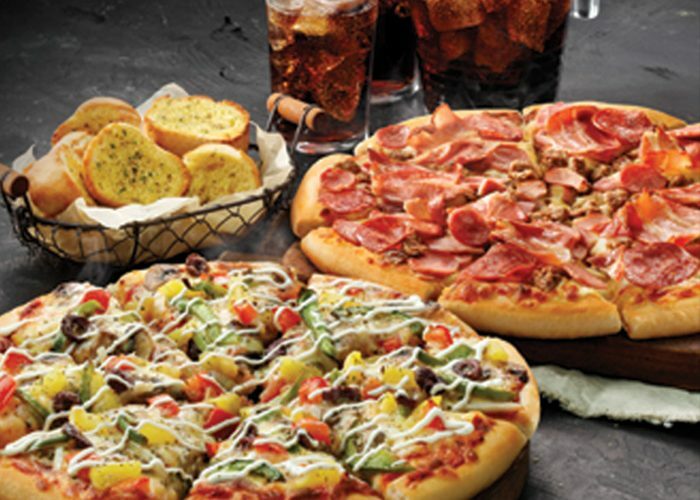 Over the years, Pizza Hut’s menu has expanded to include a huge range of extras. I mean, have you even pizza’d if you haven’t had some gooey garlic bread? The great thing about Pizza Hut is that you’ll always eat a freshly cooked pizza - you know it’s impossible to stop at one slice. How awesome that instead of having to go out to pick-up, Menulog bring your pizza (and sides) to you! And, talking about sides, there’s heaps to choose from to make your takeaway a well-rounded meal. Salads, chips, drinks, dessert, wings - all the ingredients to have your own pizza party at home.